I dreampt I was lying on a comfortable table in a private office, with a machine sending warm Infra-Red rays into my abdomen, melting away my belly fat. I was dozing, and imagining the fat cells bursting and my body’s lymphatic system scooping them up and leaving me with a trimmer waistline as I thought about my life for 45 minutes…. Oh Wait! That wasn’t a Dream! That is the Vanquish machine! It must be the 21st century because medicine has finally found a way to literally melt off fat in targeted areas like the belly, hips and thighs. 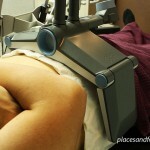 This revolutionary selective radiofrequency technology is non-invasive, safe and effective. Heat penetrates deeply into the body targeting adipose tissue (fat cells) while protecting other neighboring organs and skin layers with cooling air flow. 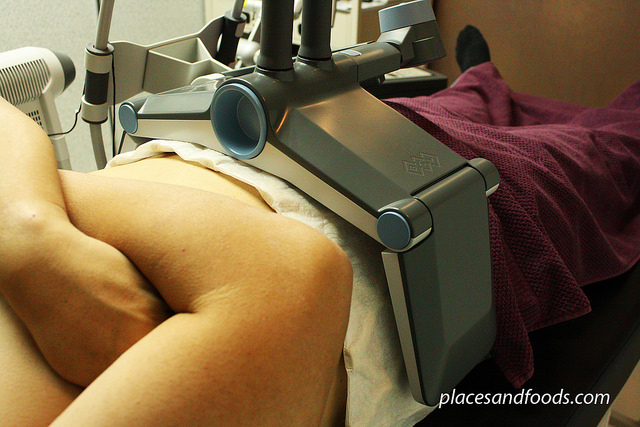 The Vanquish experience is relaxing, pain free and requires no medication or recovery time. It requires lying still for about 45 minutes. Best results are obtained when repeated twice per week for at least 3 weeks (six sessions). Clinical results are visible within 3-4 weeks after your last session – do not expect immediate results! Physiologically, your fat cells are melted and slowly die, spilling their contents into local tissue to be cleaned up by the lymphatic, immune and circulatory systems. This process takes a few weeks, which is why results are not immediate. A little science on fat cell physiology. It is now recognized that a fat cell is not just a glob of fat. Adipose tissue is a metabolically active, highly functioning part of the endocrine (hormone) system. When your energy in (food & alcohol) is greater than your energy out (activity, intellectual work and exercise) insulin directs the body to store fat. The capacity to store fat is seemingly endless, as individual cells can grow quite large while chemically signalling neighboring undifferentiated cells to turn into new fat cells. Energy deficit (energy out greater than energy in) stimulates the adipose tissue to release free fatty acids and become smaller fat cells, or the cells can die through apoptosis. Centrally located adipose tissue is used as a storage area for many fat soluble hormones and chemicals like estrogen, pesticides and THC. When fat cells spill their contents, these are also spilled. Adipose tissue also independently synthesizes chemicals like adipsin that activate the inflammatory cascade. (This is why heavier people can have more inflammatory disorders than thin people.) As the Vanquish machine melts away the fat cells, stimulating apoptosis (cell death) your body will have to clean up these excess chemicals and inflammatory mediators as well as the free fatty acids released. Fortunately, a healthy body is designed to effectively remove cellular debris like this through the lymphatic and circulatory systems. Drinking extra water is essential during this process. We also recommend using herbal teas like the Traditional Medicinal Daily Detox Tea, nettle tea and organic green tea for free radical/antioxidant protection. Taking a good quality multivitamin provides minerals and B vitamins to support liver detoxification while daily exercise will also stimulate fat burning metabolism and support free fat elimination. Nutritionally, a meal plan focused on weight reduction principles will enhance the slimming effects of Vanquish. I suggest small amounts of whole fiber rich grains a few times a week, daily leafy greens and raw vegetables, low sugar fruits like apples and blueberries, lowered carbohydrate intake, no processed foods, and grass-fed meats, vegetarian proteins and fish. Some individuals with compromised health or congested lympathic or liver systems may benefit from additional Integrative Medicine alongside Vanquish treatment plans to optimize results. Integrative Medicine combines the best of botanical medicine, clinical nutrition and evidence-based nutraceuticals with modern diagnostic, laboratory and pharmaceutical expertise. This style of medicine is patient-centered; no two patients will get exactly the same protocol with our highly individualized care. Targeted therapies could include reducing systemic inflammation, improving detoxification pathways, clearing lymphatic channels, or tailoring nutrition to promote fat elimination. Dr. Wright will be offered a group metabolic detoxification program at Cosmetic Enhancement Center in January 2015 and again in March 2015. This 7 day detoxification program is the perfect complement to a Vanquish Fat treatment plan. Ask Dr. Wright or Dr. Atkins for more information about the Vanquish Fat treatment plan, Integrative Medicine, or our upcoming Metabolic Detoxification program. Integrative physiology of human adipose tissue. K N Frayn, F Karpe, B A Fielding, I A Macdonald and S W Coppack. International Journal of Obesity (2003) 27, 875–888.